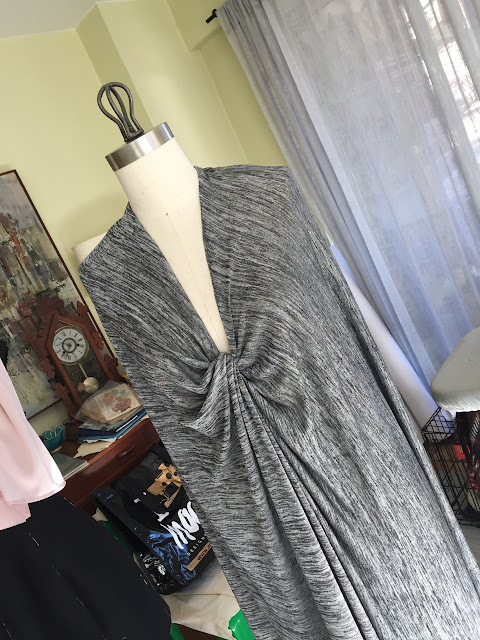 A day of draping and non-stop sewing -- my favorite kind of day! I am happy to say that I've made good progress on my knit dress assignment, though it's not going to be finished for tomorrow's class. I got carried away and spent a lot of time on small details. I wanted the dress to have piping. That slowed me down quite a bit but the results (see top pic) are worth it! You can see me sew my piping here. 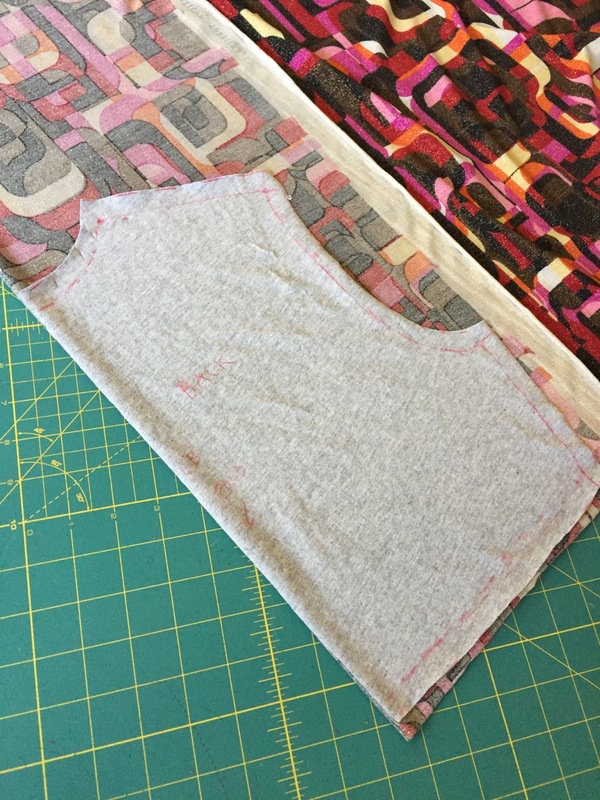 In case you're wondering, you do not have to cut bias strips to making piping with a knit -- there's already plenty of stretch. The piping really makes the midriff yoke stand out, and since I used my same fashion fabric, the effect is more subtle than if I'd used a solid color like black. 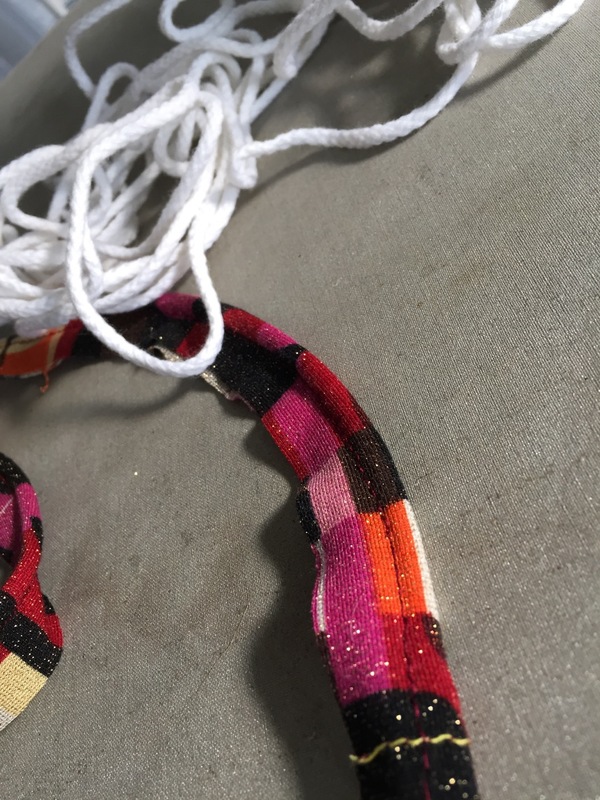 I experimented with a lot of different ideas; I wanted to make something truly wearable. A halter neck was a possibility but seemed like a bit of cheat, since you don't have to deal with armholes (let alone sleeves). Initially I thought I'd use the gray polyester knit I'd purchased the same day I bought my print knit, but it was too thin for what I had in mind. I'll use it down the line I'm sure. 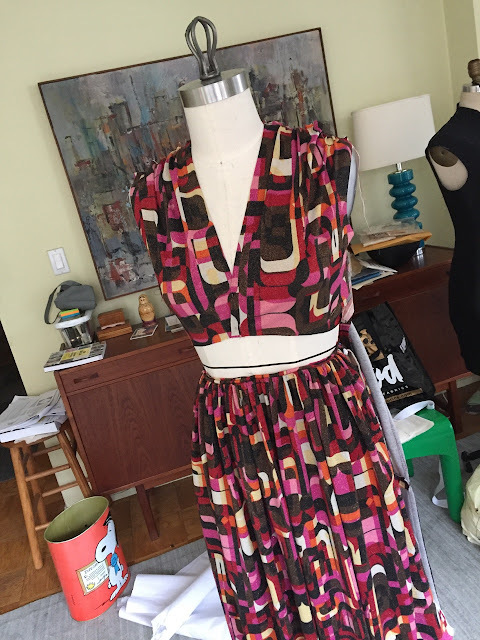 Even though my print knit was more substantial than the gray polyester above, I decided to interline the bodice and midriff yoke of my dress with cotton jersey. I figured if someone was ever going to wear this dress, they'd want a little more support and coverage. The extra layer also helps to support the weight of the skirt, which is gathered, and makes the knit fabric look more substantial. I also interfaced the yokes and front facing edges with knit interfacing. Rather than use paper pattern pieces, I cut my pattern out of cotton jersey. It made more sense to me since I'm using a stretch fabric. 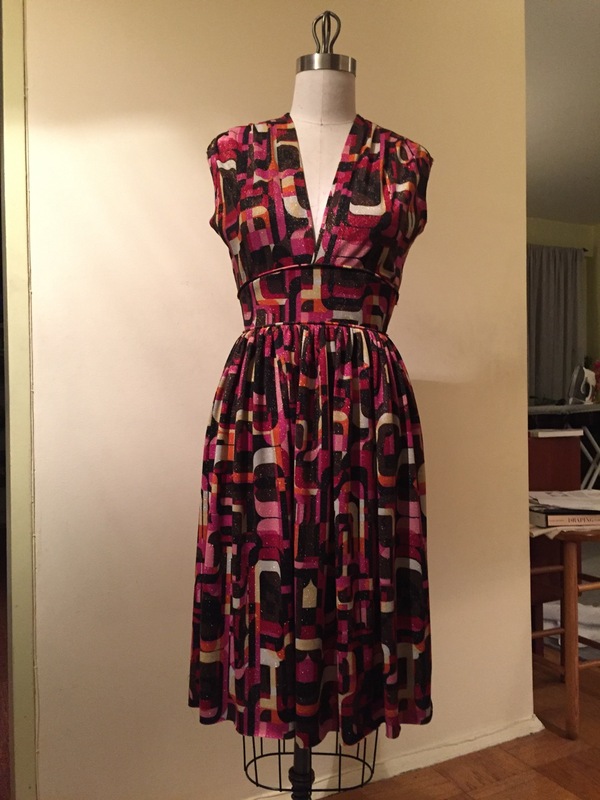 Since every knit handles a little differently, I had to do quite a bit of trimming and adjusting while assembling the dress. I still want to add bishop sleeves but that will have to wait until next week. Here's how things look as of this evening. It's nice as-is, but I really want it to have sleeves. As usual, much more sewing -- and draping -- ahead. That dress is a keeper! Absolutely lovely. I love it!. Especially the piping it takes it to another level. Peter, lovely dress; you are quite talented you know! I really want to see it with sleeves. Wow Peter! First, love the retro vibe with the pink print knit fabric and the extra attention to details like the underlining and piping take this over-the-top in workmanship. I can't wait to see what sleeves you're going to drape to finish this off. It looks great so far. oh! now I want to add piping everywhere! "very nice, as is" is an understatement. You do beautiful work and the dress is lovely. I can tell it is going to be really great when you get done. You have taught me a lot over the years of reading your blog and I have been sewing for over 50 years. Thank you. Your skill set is growing. The interlining really makes that design work. And who does not love properly placed piping? Oh this dress is so beautiful Peter! I love everything about it. The fabric, the silhouette, the piping. GORGEOUS!!! 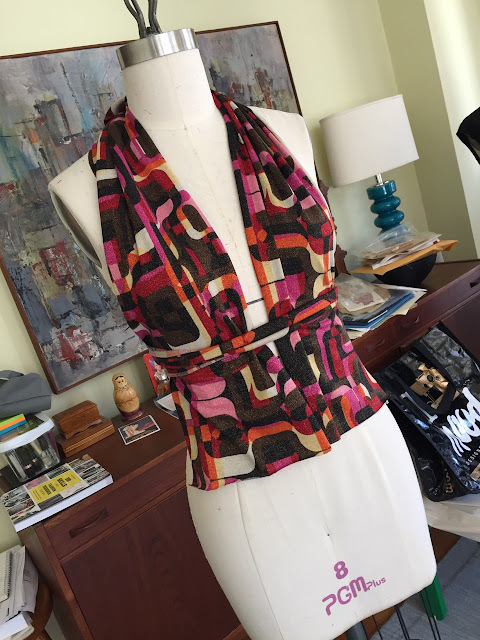 Is Draping for Knits a new course offered by FIT? When I was taking classes, I took a Patternmaking for Knits class which was excellent...but I don't remember seeing Draping for Knits offered back then. This is actually part of Draping IV, which isn't specifically about knits, though draping knits is part of the curriculum. 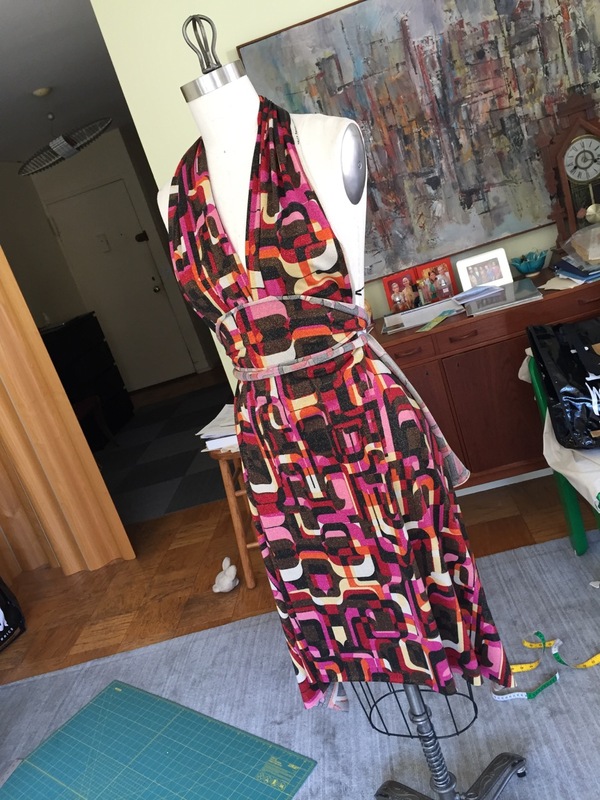 Draping IV is a "DP" class, which combines draping and patternmaking. Frankly, it's a bit of a hodgepodge. Well that's good that it is part of the curriculum! My experience of Draping IV was likewise...a bit of a hodgepodge. In my class, we really did not have any curriculum. We made whatever we wanted as long as it was draped and the professor would just go around the class and help out with advice, etc. I was a bit annoyed about this because I wanted to learn something new. Regardless, I did enjoy it and it was great fun to see what everyone else was making. 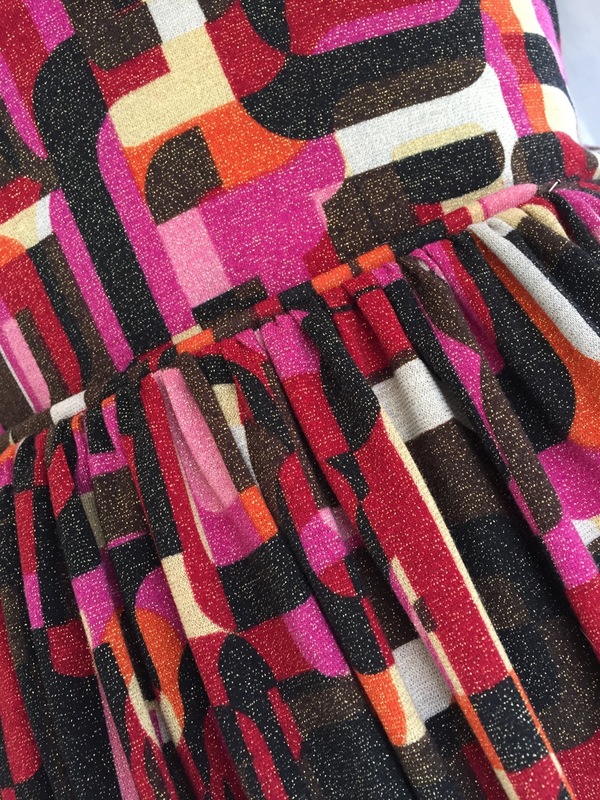 I love t - it's shaping up to be like one of those truly superb RTW dresses sold in really good department stores in the 1970s - a work of art! Someone said this dress is a keeper.....and she's right! The cumberbund makes it work so well....keep draping....love the dress! Wow - so fantastic. 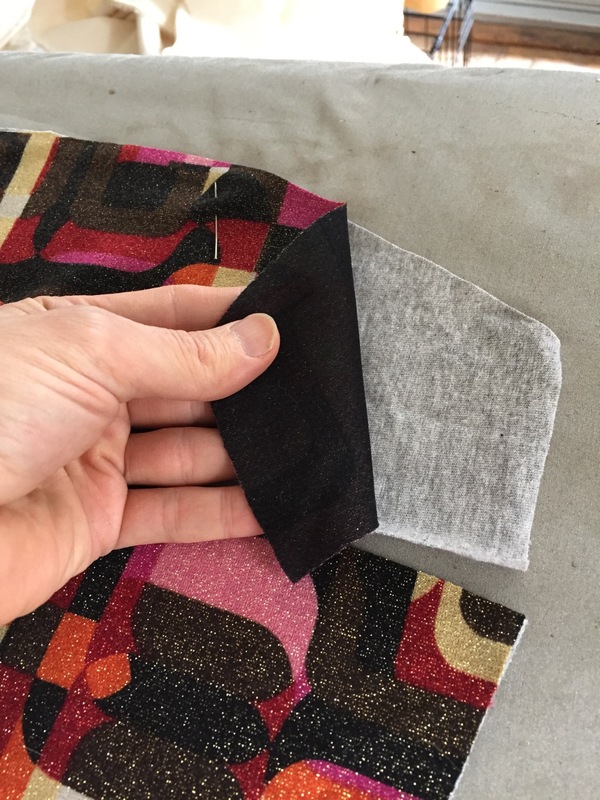 I've always wondered how you can use most knits as a pattern, especially since the amount of stretch can be so variable from fabric to fabric. It's incredibly intimidating. I have a couple of ponte de Roma fabrics sitting in my closet for that very reason.